AQUIND Interconnector will include four high-voltage direct current underground cables on either side of the Channel, connecting the landing points to new converter stations in Lovedean (England) and Barnabos (France). Four high-voltage DC underground cables will connect the subsea cables from the landing point at Eastney to a new converter station at Lovedean in Hampshire – a distance of less than 20km. 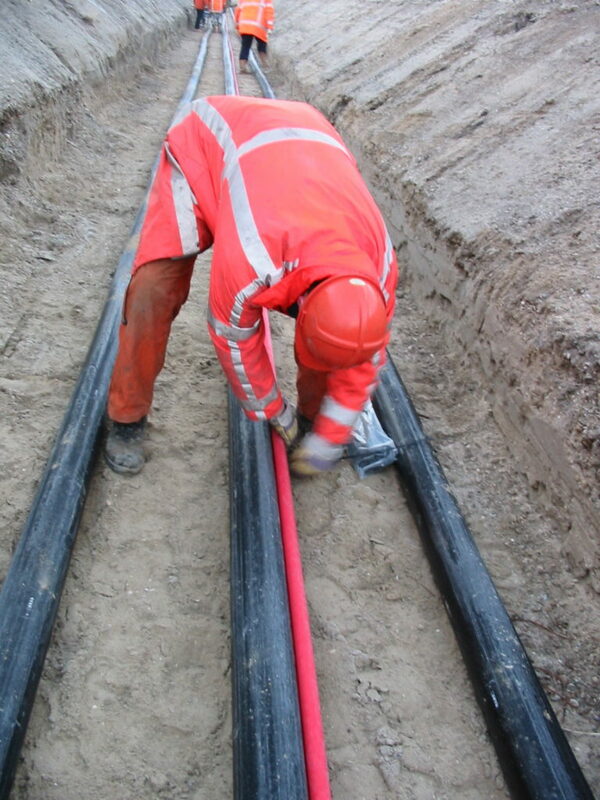 An underground data cables will also be required to maintain the interconnector and facilitate communications between the UK and France. The underground data cables will be installed alongside the underground electric cables. The underground cables will be buried under existing verges or highways, where possible. The exact methods to be used for underground cable installation will depend on the final underground cable route. A typical underground cable installation will involve trench excavation, installing ducts and reinstating the road. The underground cable can then be pulled through the ducts at a later date, to reduce the extent of traffic management. Appropriate traffic mitigation measures will be put in place before the start of any construction work. The converter station will be connected via underground high-voltage AC cables to the UK electricity grid at the existing Lovedean substation, which is owned and operated by National Grid. AQUIND presented its emerging onshore cable route to the local community at consultation events in January 2018. 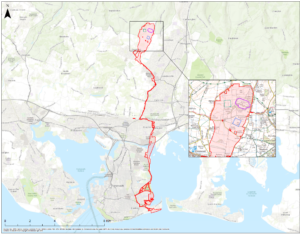 Since this time, and in direct response to the feedback received from local residents and stakeholders, ongoing work has been undertaken by the project’s engineering, environmental and planning teams to consider the potential for variations to the proposed underground cable route in order to minimise impacts on local residents, businesses and the highway network. The following proposed cable route was recently submitted as part of a Scoping Report to the Planning Inspectorate (‘PINS’). At this stage, the process of selecting a proposed cable route is ongoing and the options depicted are currently being assessed for technical and environmental feasibility. As part of our formal consultation in early 2019, the local community will have the opportunity to view and comment on the proposed cable route – together with the other onshore and marine elements of the project – before an application for Development Consent is finalised for submission to the Planning Inspectorate (‘PINS’). Our formal consultation will also include the provision of Preliminary Environmental Information, which will incorporate the initial findings of surveys and assessments to enable consultees to develop an informed view of the Proposed Development.